Marie Kondo is the Japanese author of The Life Changing Magic of Tidying Up and her newest book Spark Joy. The basic principle of her teachings is that everything in your life should spark joy, and if it doesn’t you should thank it and let it go. In her books she relates this to objects in your home or office but discusses how this principle should also apply to every part of your life. A search on YouTube reveals a multitude of people who are converts and firm believers in her ‘magic of tidying up’. I have read her books and although I can understand and agree with almost everything she says, I haven’t been brave enough yet to apply her teachings to my whole house yet. But when it comes to applying her methods to packing for a trip, it is very doable. Pack only things that you bring you joy or that you really need. Socks and underwear should also be folded and stored in something like a small bag or packing cube. Bras should never be squished down. My own tip is to fold it and store it in a cap for protection. Respect and love your belongings, so take care of them by storing them properly. Storing shoes in a shoe bag keeps both the shoes and other belongings in your suitcase well protected. Although not essential, packing systems like Lapoche Packing Organisers are a great solution for packing and protecting all your belongings in the most organised and respectful way. You can choose to colour code, using different colour pouches for different items, or keep it all one colour to make it look harmonious. The Lapoche system is very modular and all the products can be used for various uses. 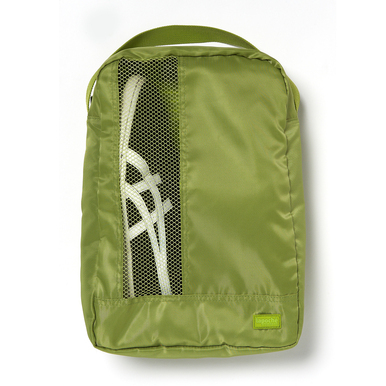 For example these toiletry organisers can be used for storing anything from charging cables to lingerie. There is a size and design appropriate for packing anything in your travel kit. You can find Lapoche and other innovative and unique products to make packing for your next trip a breeze in our Packing Accessories category.